So, I was going to use Django… until I realized I can actually just use a HTML template and have python itself edit the variables, and spit out a new copy. So that's what I did. I will probably still go to some kind of auto HTML generator, so I can add sensors on the fly more seamlessly, but this is a good start to get the rest of the back end up to date. I'm also changing a few things to be more efficent, like using 'for' and 'while' loops where I used to have mutliple code for each sensor. Here are a pic of the progress. GUI App beside the HTML output file. 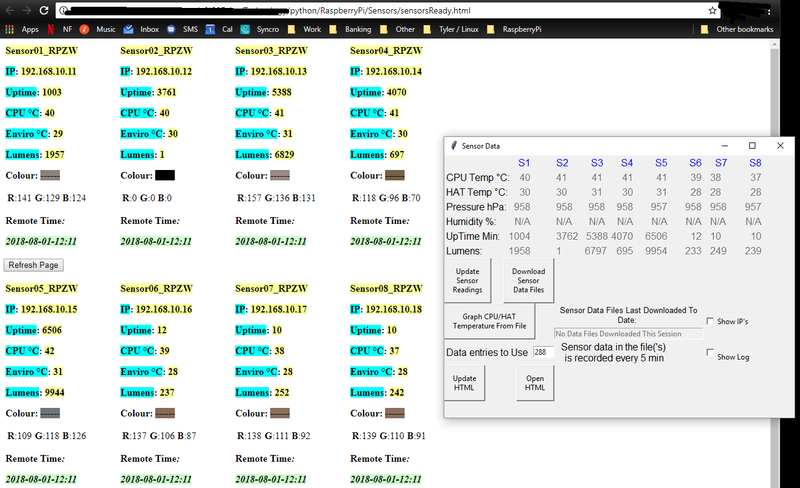 Its opening the html doc locally, but it will be on the Sensor "Controller", accessed through a http server. I'm pretty happy with the progress. I'm now waiting on some hardware to arrive, so I can get started on making the Sensors self sustaining for power. I have also done a lot of other updates since my last post. Here's a quick point view. Created install script for new sensors -> One command you run in terminal and in the end, you just change a IP and your done! New sensor ready to go. That's it for the most part. I have also been hanging out on the Raspberry Pi IRC channel, and getting some decent ideas from there.